The growth of Sinn Fein following the 1981 hunger strike threatened the political status quo in both parts of Ireland, but the fears expressed by Fitzgerald’s government bordered on paranoia. A confidential note of a May 1983 Dublin meeting between Fitzgerald and the then British Direct Ruler Jim Prior records that the Taoiseach had made “strong representations” about several issues -- firstly that that there had been “an instruction from a Northern Ireland Minister that their decisions should seek to favour Sinn Fein”. The highest levels of his Fine Gael/Labour coalition also accused the British government of making it a “policy decision” not to arrest Martin McGuinness, the records show. Fitzgerald based this on the belief that the notorious supergrass Raymond Gilmour, who implicated over a hundred Derry republicans (35 of whom were later brought to court) must also have held evidence against Martin McGuinness which had not been acted upon. The documents are part of the annual tranche of files released under a 30-year rule in Dublin, London and Belfast. Up to one quarter of the files were nevertheless withheld and almost half partially censored for reasons of state security or because they contain “sensitive personal data”, according to officials. But the files give an insight into government thinking thirty years ago, when Sinn Fein first polled more than 13% in the General Election and Gerry Adams was elected MP for West Belfast. Papers released in Belfast show that Fitzgerald and Dublin civil servants separately raised the issue of the failure to arrest Martin McGuinness with top British officials. The allegations were denied by Prior, who insisted there was not enough “sustainable” evidence to arrest Mr McGuinness. In the end, all of Gilmore’s testimony was thrown out by the Diplock court judge as being “entirely unworthy of belief”. But while Mr Prior was meetings that Taoiseach and other Irish ministers, officials from either side held a separate meeting on British relations with the Sinn Fein leadership. A five-page note of the contact records the Irish officials’ unhappiness at stories of British officials “hob-nobbing with Sinn Fein”, with the secret note adding that it appeared to be fuelled by the belief that British ministers “thought Sinn Fein could be tamed”. At the time, Garret Fitzgerald had publicly suggested proscribing [banning] Sinn Fein as a means of preventing the growth of republican politics in the North -- but also to prevent a similar threat to the established order in the 26 Counties. And following a shock IRA attack at the heart of London’s commercial centre in December 1983, the British government also considered the move against Sinn Fein. However, one advisor to Margaret Thatcher noted: “It would be seen a reaction to the London bombing, when terrorist outrages in Northern Ireland had brought no such response”. In the end, the idea of banning Sinn Fein was rejected. 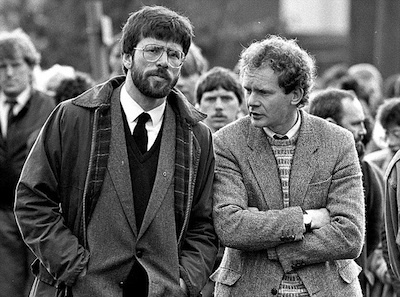 Negotiations between the two governments on how to shore up support for “constitutional nationalism” continued through 1984, before leading in 1985 to the Anglo-Irish Agreement, a document which gave the Dublin government an advisory role in the Six Counties for the first time.